Do you like jogging? So do I. I jog a few times a week. So in this article, I’d like to introduce three good courses in Kyoto for joggers. Even if you have tried a treadmill and hated it, I’m sure you will be able to enjoy it more on road surrounded by Kyoto’s picturesque scenery. But if you plan to jog during summer, please be prepared for the heat and bring a small bottle of water or coins (150 yen) so that you can buy one from a vending machine whenever and wherever you need to get some water. Kamogawa River is by far the best jogging course in Kyoto. The beautiful view from Kamogawa river makes you run further than you thought you could. And it changes every season. Kamogawa river is very long, so I recommend you decide how far you want to run before you start. When you plan, choose one bridge which will be both the starting point and the goal. My personal favorite is from Oike bridge to Kamigamo bridge. I usually jog between these two bridges. If you like you can pay a visit to Kamigamo shrine for a quick rest and sightseeing in the middle. When choosing a bridge, be sure to choose one with a station nearby. 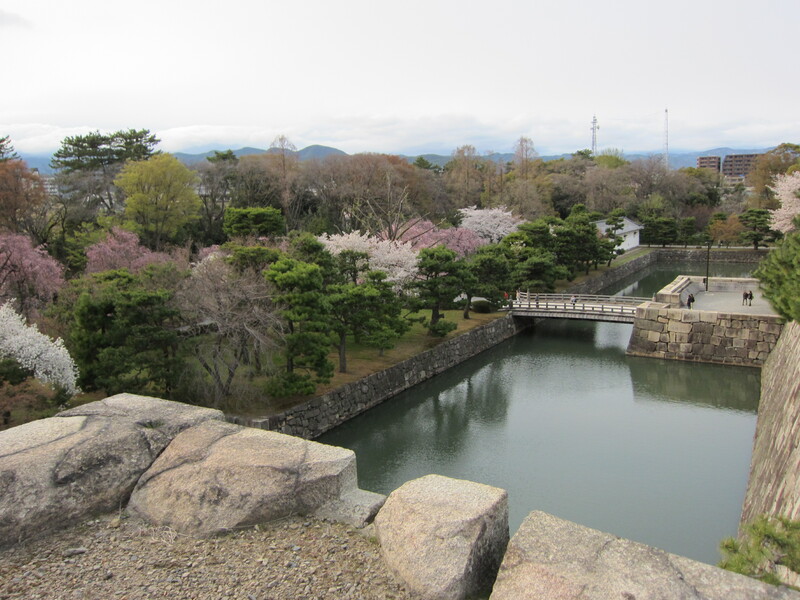 Nijo Castle is a castle built in　1603 by an order from General Tokugawa Ieyasu. This castle was supposed to be used when the General came from Edo (Tokyo). The castle was surrounded by traditional white walls with a moat. If you jog around the moat, it will take 8 – 20 minutes depending on how fast you are. The distance is 1800 meters or 1.1185 miles. Seimei Shrine and Nishi Honganji Temple are both located on Horikawa street which can be good as a starting point and goal. Horikawa street has a wide walkway, so you can jog relatively freely although you need to watch out for bicycles passing by. 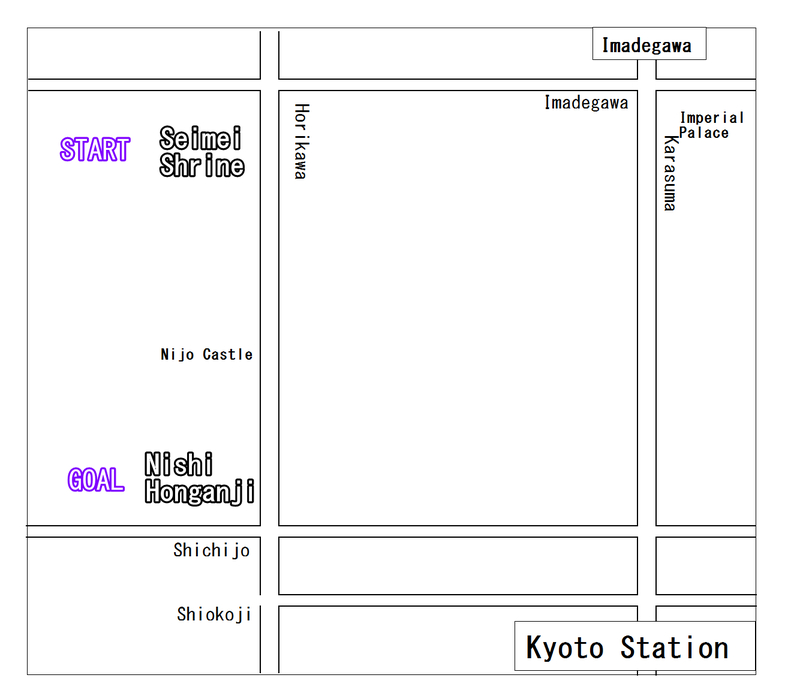 Let’s say that you stay at a hotel near Kyoto station. Take the Subway Karasuma Line and get off at Imadegawa station (Kokusai Kaikan bound: 250 yen). Go to Karasuma Imadegawa intersection and walk to west until you hit Horikawa street. Cross the intersection and then turn left. Go south for another 100 meters, and you will see the starting point, Seimei Shrine. Be sure to pay a visit to this mysterious shrine (check upcoming guidebook for details). The distance between Seimei Shrine and Nishi Honganji Temple is 4.4 kilometers (2.73 miles). 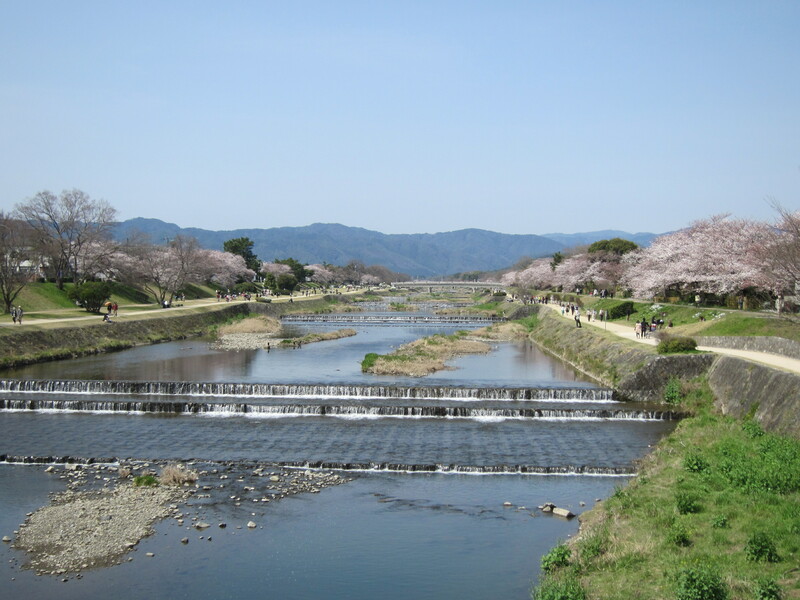 Learn more about our Kyoto e-Guidebook here.